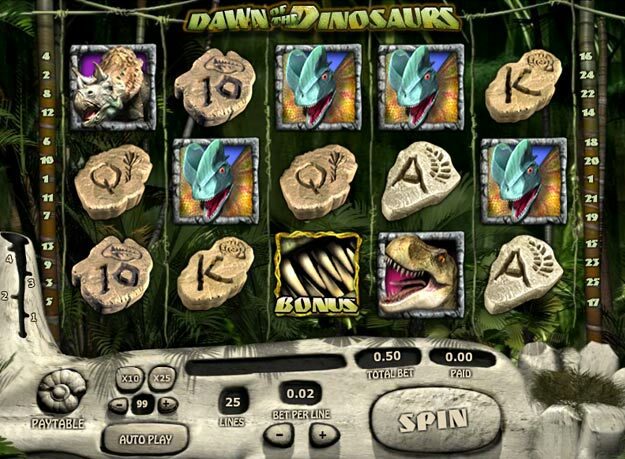 Dawn of the Dinosaurs is an interactive and fun online video slot game with loads of exciting bonuses, multiplied wins, FREE spins and more! The dinosaurs are back! Play today at Gossip Bingo! Good luck! Travel back thousands of years and enjoy Dawn of the Dinosaurs slots. This fun dino-themed slot is a packed with bonus features, a spin multiplier and the chance to win a mega jackpot of 100,000 coins. There are 25 pay lines to place your bets on and wilds and scatters to look out for. The Raptor Clash Bonus game is activated by the scatters and there’s a further Free Spin Explosion round with multipliers on top. Spin the right symbols and Dawn of the Dinosaurs will win you a mega prize.